The University of Central Arkansas’ Health Physical Education and Recreation Center (HPER) originally opened in 2000 as a 72,000 sq. ft. recreation center. In 2012, the process began for an extensive expansion and renovation. In addition to the three existing full-sized basketball courts, the expansion and renovation included a natatorium featuring a six lane 25-yard lap pool, a weight room, cardio room, and three group exercise studios. 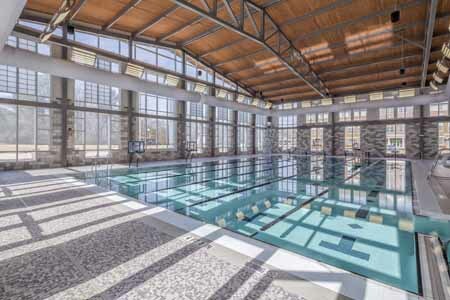 Aquatic amenities include a 3,200 sq. ft. competition pool complete with six 25-yard lap lanes, one-meter diving board, climbing wall, water basketball and volleyball, and stair entry. The goal of the expansion and renovation was for campus recreation to continue to fulfill its mission in helping make the campus a healthier place as a whole. The Campus Recreation Department has a tradition that offers students a wide variety of healthy activities at all ability levels. Opportunities for active competition, fitness conditioning, skill building, stress release, leadership development, and peer socialization is available through HPER.